If you’re a Parks and Recreation fan, you’ve heard of the phrase “Treat Yo Self!”, which has been made famous by the larger-than-life characters Tom (Aziz Ansari) and Donna (Retta). Every once in a while, these two characters would celebrate “Treat Yo Self!” Day, by pampering themselves with an overall disregard for potential consequences. We’ve all had a day where we treated ourselves in order to counteract the negatives in life. While I believe we all need days where we treat ourselves, I also believe we need days where we teach ourselves. If you read last week’s blog post, you know that it’s a great time to immerse yourself in the digital world. Part of this means that you have the tools to explore new things and learn new skills. Below I have listed some of the resources that allow you to do this. Video tutorials are great for many reasons! First of all, they’re interactive! This is great for other visual learners like myself. Second of all, you can learn at your own speed! I particularly like this aspect since certain subject matter can be extremely difficult to learn on my own. Unlike traditional lectures, you can refer back to a given point or pause when you need to take notes during video tutorials. Third of all, there are so many different sites to choose from! Whether you go to YouTube, Udemy, Vimeo, or any other video site, chances are you’ll find what you’re looking for. Another great thing about having this much competition in the video tutorial world, is that you can test out which “teacher” you like best and which teaching style best suits your individual needs. Online classes come in a variety of forms. There are sites that have a collection of video tutorials such as Udemy.com or Lynda.com, and there are sites that have simple interactive lessons designed for helping you practice the material, such as Codecademy.com. 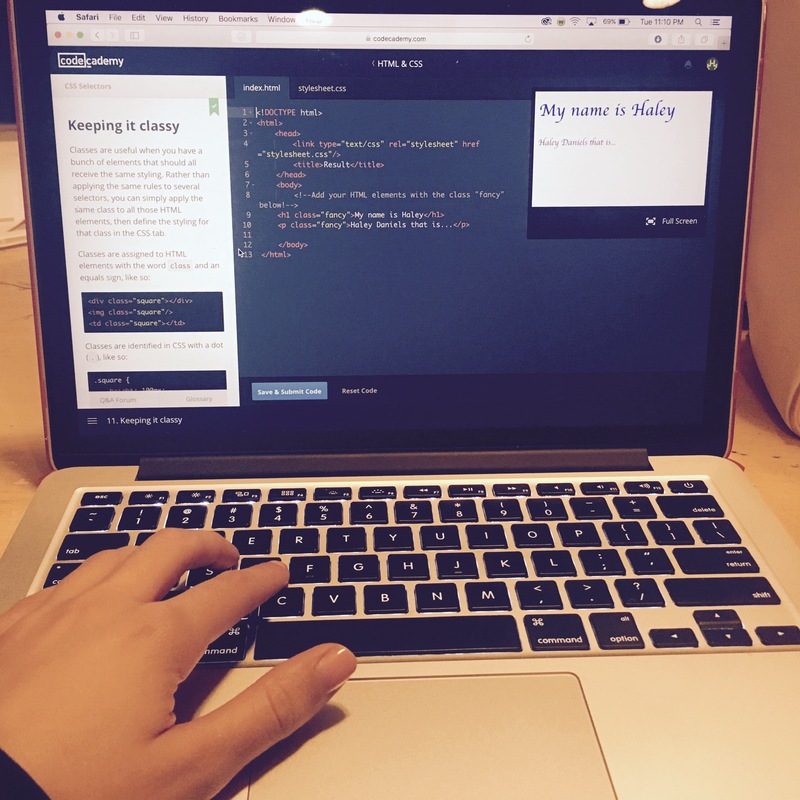 I have used both Lynda and Codecademy, and have had wonderful experiences with them! I personally love online classes because all of the lessons you need to learn are available in one place and you can, again, go at your own pace. Many colleges also offer online courses which can be great as well! Even though these are more likely to have deadlines and set schedules, they are very convenient. The only problem is remembering to log on and complete your coursework! Even though set online courses usually cost money, it can sometimes be worth it! Think of forums as virtual spaces where you can get feedback from your peers! Many sites have forums where customers can ask questions and have them answered by other customers. I personally look at Adobe’s forum sections quite a lot to get answers on how to apply certain effects within their Creative Cloud programs. Even though I’m usually not an active participant, I learn a lot from lurking around in the background and taking notes. Many people like the website Reddit, where you can find a Sub-Reddit (or category) for just about anything. I’ve personally had many random questions answered purely from research done on Reddit. Long story short- never underestimate the power of community! I’ve learned a lot from my friends on platforms such as Facebook, Twitter, Instagram and LinkedIn simply by asking questions in my statuses! You’d be amazed on the advice people have to give for different subjects! I’ve learned so many things from all of you just from the #TellMeTuesday questions I ask on my Twitter and Facebook page! In college I’d use Facebook as a middleman to find people to interview for assignments. Not only did it help me save time and resources, but I also learned so many new interesting facts about people I knew for years. You can also learn a lot about politics and community news from these sites as well, but just watch out for those comment sections! Whenever there’s a controversial subject, claws will come out! It’s easy to want to get involved, but nine times out of ten it’s not worth it. Last, but not least, there’s Google! Google has helped me educate myself ever since it became the leading search engine. Whether I’m looking up the origin of an old saying or finding a scholarly article to write a paper about, Google has always been there for me! Google has also expanded to have a plethora of functionality besides serving as a search engine. There’s now Gmail, Google Drive, Google Docs, Google Slides, Google Analytics, Google Adwords and so so so much more! Each of these tools have helped me with my educational and career goals and needs! Take the time to dive into Google’s tools and see for yourself just how handy they really are! Google also bought YouTube a few years back, so you can integrate your YouTube account with these other accounts as well. I know I keep saying this over and over again, but we live in a fascinating time! I’ve personally watched my boyfriend reinvent himself with the skills he’s taught himself from simply using these online tools. You can read his story here. I hope you are either already using these tools or you are planning on checking them out! Everything has gone digital, including your education. What is something you learned how to do from online training? My husband, Ted, has learned all sorts of cool things on the internet that have saved us a lot of money. He has learned how to fix a lawn mower, how to change a water filter on a refrigerator, and recently how to fix a toilet. I want to learn how to refinish wooden furniture, which I plan on learning on the internet. That’s great! It’s amazing that you can also learn how to do more difficult tasks as well as smaller ones. I learned how to make a Dr. Atkins Muffin in a cup! I also learned how to fix my printer. I pretty much learn something new on Google every day!!! !